This very dangerous preservative is today used in almost all personal care products. They all just use it in their products and they do not inform you about the huge side effects, so it is time to become aware. As the side effects will give many other health issues we all need to learn what we can do to prevent this preservative to be used by any of us. What are the side effects and in what products is this preservative used? We will inform you in this post how to make sure you are not using products that are preserved with phenoxyethanol or with its sisters and brothers. Other names are given to confuse everyone. Be aware. The question is: Do you want to have a healthy skin, do you want to have babies now or later in life and do you want to keep your DNA to yourself? If your answer is Yes than be sure all your products are free from: phenoxyethanol. Today the beauty industry has replaced all paraben, with phenoxyethanol and the truth is that this ingredient is more dangerous than all paraben together. Phenoxyethanol is also called by some; a natural preservative, but it is far from natural and you are being poisoned when you use products that contain this preservative. Today this preservative is used in all our personal care products and in all baby products with or without our knowing. Many manufacturers are not informing you about this preservative they use in their products. They do not mention it on their labels. After contacting hundreds of manufacturers myself, they all admitted that they do preserve their products with phenoxyethanol. Some think that only a little is not so bad and others know about all the dangers and do not care. Most manufacturers do not inform us about the use of this dangerous preservative at all. When you know what phenoxyethanol does to our skin and health you do not want this ingredient in any of your products ever. And when you know what side effects this simple preservative has, you do not even want it near yourself of near your baby. Many of these manufacturers which use phenoxyethanol as a preservative are producing products for eczema, for allergies, for babies, for make up, for beauty & for health. And you will get eczema and allergies and more from this dangerous ingredient? When you use this ingredient on a skin with eczema, your skin will be inflamed multiple times worse. So they produce products for treating eczema and use one ingredient in this product that also creates eczema and more. We need to wake up now. Be aware of what ingredients are used in your products. When a product is created with water or aloe vera gel or similar, they need to find a preservative to make sure it does not get moldy. But there are other true organic and naturals preservatives they can use. But they do not know this and have not been educated to use natural preservatives or they just copy each other and do not think for themselves. All lies are told on the internet so that everyone is not worried about using these dangerous preservative. On many blog post on the internet, girls are given advice from the wrong side of our world. These so called doctors and specialist advice all that is bad to the girls on forums online. All their advice will create health and skin issues instead of solving them. Therefore the only thing I can do is educate you as much as possible as this is needed with so much false advice on the internet. You do not have to have skin issues or health issues or have issues about getting pregnant. We only have to know what is good for us and we can reverse all damage. Phenoxyethanol is also known as Ethylene Glycol Ether, a Glycol ether and bactericide (that functions as a disinfectant, antiseptic or antibiotic) that is primarily used as a preservative in cosmetics and beauty products. It is also seen as a fragrance additive, a fixative for perfumes, an insect repellent, an ingredient in sunscreens, a topical antiseptic ingredient and solvent. It is made out of carcinogenic and toxic compounds. Johnson’s for babies is one of the worst brands to use for babies. The old version was already bad to begin with but now the new formula is made with phenoxyethanol and so many other chemical ingredients that this product should not even come near a baby. All the baby brands you buy in your local shops are filled with dangerous chemicals and dangerous preservatives. When you are a mother to be or have a baby, please look for organic products from trusted family owned suppliers only. In this Johnson’s baby shampoo, there is not one good ingredient, not one healthy natural ingredient. And we use it on our babies head? This information is from the Unilever website: Unilever produces products (food, personal care, household and more) that are sold everywhere in the world. Unilever answered: We use phenoxyethanol across our personal care product range, including moisturisers, cleansers, soaps, cleansing wipes and baby skin creams. We also use it in some laundry liquid detergents. So unilever use it in all their products, be aware as these products are sold all over the world. So besides the use of GMO ingredients they admit they use phenoxyethanol in all products including their laundry detergents. Now you know why everyone has skin issues and itchy skin and more. Unilever who uses bad GMO ingredients and more. ECOS Laundry detergent caused extreme eczema on my feet. The company is misleading consumers with claims of earth friendly products and yet adding preservatives which have been proven to cause eczema. i.e. phenoxyethanol & methylisothiazolinone, I found indisputable evidence of this on the internet. Unbelievable that the use of these toxic chemicals continue to be used by companies who claim their products are Free and Clear. I was tested ages ago after years of dealing with what was then called “contact dermatitis”. Turned out I was very allergic to Phenoxyethanol and ever since I have been reading labels on everything, including shampoos/conditioners, fabric softener (which I have stopped using), laundry detergent. It is very disappointing to find a product that everyone raves about, only to see that it contains Phenoxyethanol. I am also allergic to nickel, orange-dispersed dye (found in lycra), huge allergy to PPD (para-phenalenedynamine) – ingredient in almost EVERY hair colour (other than Goldwell Elumen and Wella’s Koleston Perfect – the only two that don’t have PPD). I’m sure some hair colours also contain metals. It’s been a learning process for sure. 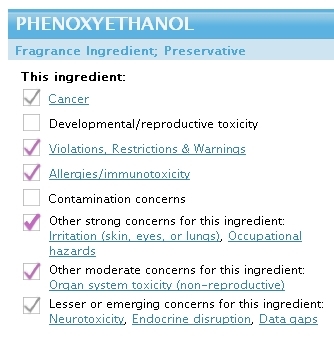 So far, I have only been looking at the ingredients for Phenoxyethanol, but it has other synonyms, which I forgot about. I quickly realize when I have a reaction. How can we stop the cosmetic companies from using Phenoxyethanol and PPD? It is so dangerous! Regarding Phenoxyethanol: I work at an alternative/natural health clinic. A few years ago I was privileged to be tested for DNA adducts, which are things, (like chemicals for example), that have attached to the DNA in your cells. DNA provides the instructions that tell a cell how to grow and divide. Many scientists believe that cancer can result when DNA becomes altered and gives faulty or missing instructions. You do not want altered or mutated DNA!!!! Well, guess what was among the adducts I had? PHENOXYETHANOL! I had never even heard of it. Then I was dismayed to find it everywhere in cosmetics, especially the “natural” ones. I threw out everything including expensive products from that one celebrity M.D. dermatologist whom we all know, as well as those promoted by the supermodel & French doctor. I avoid this chemical now like the plague. I do not want anything adducted or attached to my DNA. Phenoxyethanol is very bad, caused me and my son $1000 of dollars in doctors bills, also linked to cancer and is banned in Europe and Japan for good reason its very bad for us wake up FDA ban this ingredient ! My personal note: it is not banned in Europe yet but it should be banned at once in Europe and everywhere in this world. Studies have shown that phenoxyethanol can be an extreme irritant to the eyes (it is in every mascara) and it is an extreme irritant to the skin, it can even cause blistering. (think of your eczema or itchy skin or your babies eczema or skin rashes) It is hazardous in the case of ingestion and inhalation as well (as in perfume or as in fragrance). It is a reproductive toxin as well as an ovarian toxic. Besides using it in all our products they use it in our vaccinations as well. Phenoxyethanol can cause blisters on the skin, imagine what it will do to: our organs, the little bodies of our babies and children and your pets organs when they put it in the bloodstream with a needle. The Cosmetic Database rates it as a moderate hazard and notes cancer, allergic reactions, skin, eye and lung irritation, organ and neurotoxicity as possible effects of using products containing Phenoxyethanol. It has shown effects on sensory organs even at low doses!! And it has effects on the brain and nervous system at moderate doses in animals. And final it causes cell mutation. (meaning DNA changes). When it has been damaging to the animals they tested it on, than why using it in any product and specially why use it in baby products? In mice, it showed chromosomal changes and genetic mutation effects as well as atrophy and reproductive damage. Well your organs will get old and shrink and you are not able to produce babies anymore. This means men and women. That’s why everybody has a hard time getting pregnant or having healthy babies these days. It all is explainable. And when you want to be pregnant they give you hormones and other chemicals with more than 60 side effects for both the mother and the new born baby. How to be healthy when you are bombarded with chemicals even before you are born. We need to be alert and check all our products ourselves. But what if it is in your perfume bottle (men and women) or added and hidden under the name of fragrance/parfum to your products, you still get phenoxyethanol in your system. Take a look at your labels and you will see that this ingredient is in almost every personal care products these days. This needs our concerns. Today they use phenoxyethanol and tomorrow an other new and dangerous preservative or they just give phenoxyethanol a new name. That is what they are already doing. We need to stop them from using these chemicals, by not buying those products anymore. Be wise and alert. The power of our wallet is big. Time to use it. When phenoxyethanol is not showing on the label, it is hidden under the name of parfum or fragrance, or just in your product anyway. Unless you find an organic manufacturer who knows how to use natural preservatives. There are so many natural preservatives but again they must be natural, wildcrafted or organic otherwise you will have GMO preservatives again. The main ingredients are……means it is including phenoxyethanol! On my search for the best products, I have asked many suppliers what they used for preserving their products and every time they came up with: we use only a little amount of phenoxyethanol. They truly think it is either natural and not so bad as they only use a very small percentage. Well they do not know and are educated by the wrong people about what to use in their products. Some times they do not mention it on the label as they will say on the internet: the main ingredients are, after which they sum up some healthy ingredient names and when you ask the full listing of their ingredients they will give you the sometimes more than 30 chemicals list including the phenoxyethanol treat. When they use the phrase: the main ingredients are…., you now know to leave that website for sure. Why do they allow this ingredient to be used? The dermatologist is doing good business and so will your doctor and the hospitals. That is the reason it is allowed and used, Big Pharma is making money over all your ailments. 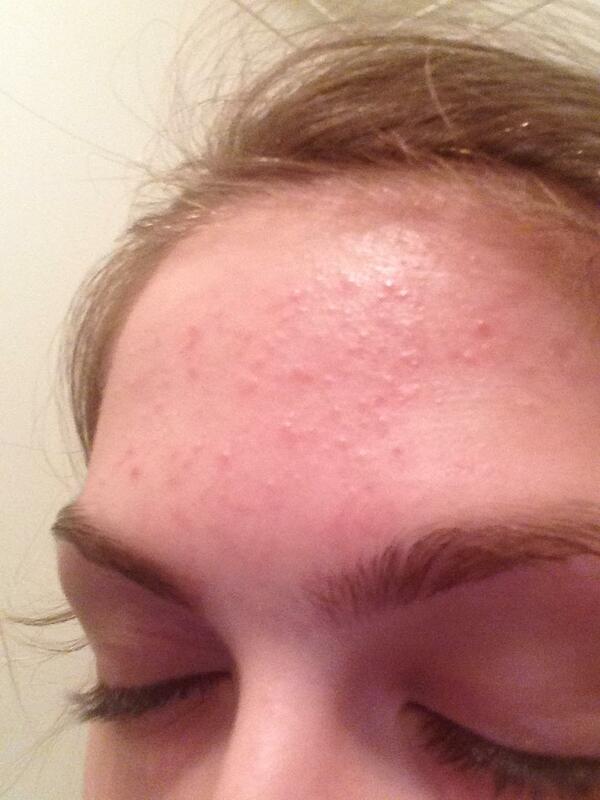 The whole world is having skin issues, eczema, dermatitis and the most strange diseases. And what is very dangerous for all of us is that everyone their DNA will be changed every day again when you use a product with phenoxyethanol, or other chemicals, all without your permission. So please take a look at all your products. Phenoxyethanol has now been given other names to confuse you as they know we know about the dangers. There will be more names as they know when to hide this ingredient as we are now aware of the dangers. It will not stop them for using other dangerous preservatives, so stay alert and watch your labels at all times. We will keep you informed. Is it bad that chemicals change your DNA? Biochemical or cellular level changes happen when you use chemicals that will alter your DNA. This means your ability to heal yourself, the self healing system of your body, your DNA will be destroyed. You need your DNA and you do not want it altered by others. Our DNA is our survival mechanism on earth for our health, and it is our connection to source energy and our spiritual connection. Our DNA is encoded with light and with so much wisdom. Our DNA directs our body system to do its work to be and to stay healthy. And so much more. You can heal your DNA again with our recipe of Aloe Arborescens. Or you can use your own fresh aloe without the use of chemicals or chemical preservatives. We all are energy and we need organic food with natural energy and high vibrations. And you can detox all theses chemicals out of your system on a regular base with Chlorella, Aloe, Charcoal, Black seed oil and more. You can also detox and renew your DNA with the use of a far or near infra red sauna. We will show you all these products on our website but you need to know which supplier has the best product as otherwise it will not assist you in your health and detox at all. It is in your sunscreen, all facial products, scrubs, moisturizers, eczema creams, serums, body wash, all make up products even your mascara’s and your lipstick or your powder could contain it, shampoo, cream shampoo, hair dye, all baby products, soaps, soap for your laundry, your vaccinations, your pets vaccinations and so much more. Today phenoxyethanol is also added in most organic products, in all natural and chemical free products and all paraben-free products. Phenoxyethanol is in almost every product. Therefore we have selected those products on our website that do not contain phenoxyethanol. When they tell you it is phthalate-free it still contains phenoxyethanol. So just because something is phthalate-free or paraben-free, does not mean it is safe at all. Ingredients with added fragrance means phenoxyethanol is present. Ingredients with added perfume means phenoxyethanol is present. When some companies may claim that their phenoxyethanol is extracted from natural sources, it has the same chemical structural formula, and it would pose the same risks. Just stop buying these products and they will have to stop producing them. Your skin and health will thank you. Be wise and use only products that have the right pure ingredients and that are organic or wildcrafted. Some suppliers will not tell you the truth and will hide their ingredients including the fact that they use phenoxyethanol. Therefore you need trusted suppliers only. But some trusted suppliers have good products with good ingredients and at the same time they have some products with phenoxyethanol. You need to be alert. We have selected the best suppliers and their best product for you on this website. We will help you as all our products are free from chemicals, free from chemical preservatives, parfum and fragrances. And all our products are from family owned and trusted companies only. Be wise, healthy and beautiful.